Y Combinator-backed HireArt, a job applicant screening service which today touts business customers including Airbnb, Cisco, eBay, Gap, Facebook, General Assembly and others, is today launching a second, less expensive pricing tier designed for those who don’t need a full-service recruiter, but rather a curated feed of potential job candidates they can review themselves. Launched last year by three college friends from Yale, Elli Sharef, Dain Lewis and Nicholas Sedlet, HireArt has until today been focused on offering employers a contingency service, where it took a success fee of 10 percent of the first year salary from those job applicants it helped to place. At its core is this idea that reviewing candidates through a resume process is broken. Applicants like to exaggerate their experiences, and sometimes even outright lie about their abilities. Other times, great candidates are missed because their backgrounds don’t seem to match up with what the employer has in mind in terms of experience, leading them to slip through the cracks. HireArt’s solution, instead, is to have job candidates actually do the work first. The applicants complete a series of tasks that demonstrate they have the skills needed for the job at hand. For example, if they’re claiming to be an Excel expert, they might have to create an Excel model using a provided dataset. Meanwhile, creatives might have to come up with a product pitch. 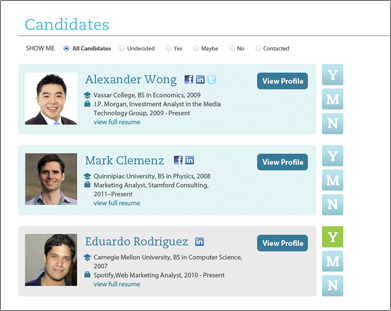 Candidates applying to positions on HireArt can upload files, write out responses, or even upload videos, depending on the task. Employers can either review the applications on their own, or outsource that work to HireArt if they choose. To date, 70,000 candidates have applied for positions advertised on HireArt from nearly 300 employers. Many of these companies are in the startup space, but some are bigger name brands, like Gap, Safeway, and Cisco. Facebook is a newer addition, having recently posted its third or fourth job. According to Sedlet, HireArt’s business has been growing at around 20 percent month-over-month, but it’s so far been a “high-touch” recruiting service that uses software to try to bring the headhunting process online. Today’s launch of a more affordable plan is a move to bring HireArt’s services to an expanded customer base. The new plan is $595 per month, allowing employers to get a feed of applicants that are first curated by HireArt, and access to an optional account manager, if they need someone to speak to. “The new product is aimed at companies who don’t necessarily want a headhunter because they’re expensive or they’re not quite right for certain jobs, but they still don’t have time to wade through tons of resumes,” says Sedlet. He adds that it’s still about simplifying the hiring process for these business customers, while also allowing them to retain more control. The company uses a small team of “graders” to review the applications from candidates, using a rubric developed internally, so even the new pricing tier involves some human involvement during the “curation” process. But with the lower-priced tier, HireArt doesn’t provide its additional recruiting services, including scheduling interviews, negotiating salaries, or selling candidates on the job itself. Employers simply receive the applicant feed with work samples and video interviews, which they can also now share internally among colleagues at the company to get further input. HireArt also confirmed that it raised $1.4 million seed financing in the form of a convertible note from Learn Capital, Felicis Ventures, InterWest Capital, TripleWest Capital, 500 Startups, Gus Fuldner and other angels. 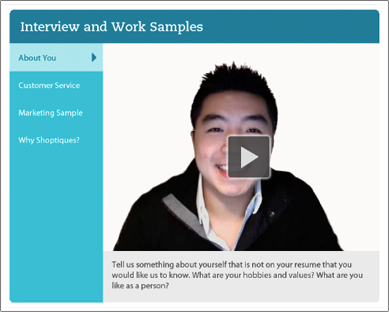 The company competes with others combining video interviews with recruiting services, including HireVue, VidCruiter, Interview Rocket, Take the Interview and many more. Employers interested in trying the new service can use the discount code “TechCrunch” for 25 percent off. (Valid for a month from today’s date).